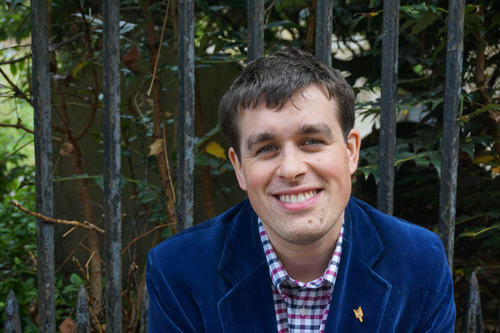 Our Bright Young Collectors series continues this week, during our California fairs coverage, with a California book collector, Matthew Wills, who recently won the inaugural California Young Book Collectors Prize. I currently live in La Jolla, California, but I originally herald from the south of England. I moved to the United States in 2014 to pursue my doctoral studies. I studied history as an undergraduate at Trinity College, Oxford, before moving to Beijing to study Chinese at Peking University. I am now in my 5th year of a History PhD at the University of California, San Diego. I am mentored by Professors Paul Pickowicz and Karl Gerth. I have collected Chinese propaganda for years, but my real interest is in books/periodicals published in the 1970s during the Criticize Lin, Criticize Confucius campaign. In this campaign, the Chinese Communist Party orchestrated mass criticism of Confucius and Confucianism, as well calling on people to denounce Mao’s former heir-apparent (Lin Biao) as a present-day lackey of Confucius. This campaign was the last hurrah of the Great Proletarian Cultural Revolution and publishers/printers produced some amazing print culture to substantiate the state’s narratives and show people why Confucianism and Lin Biao were enemies of the people. I study the print culture of this campaign for my PhD, and over the last six years I have amassed a collection of books and ephemera. I just tried to count the collection and it falls somewhere between 600 and 700 items. My items range from books with a print-run in the hundreds of millions all the way down to pamphlets printed by the propaganda divisions of counties and villages. My collection also includes comic books, drawings, small posters, and periodicals. While most of the items are in Mandarin Chinese, I also own some books printed in English, Braille, and the languages of China’s ethnic minorities. I can’t remember which book I bought first because that was a long time ago! When building the collection I acquired a lot of pamphlets first, before moving on to more specialized books such as the comic books or the Braille items. My last purchase on my most recent research trip to China was a selection of articles from the theoretical journal Study and Criticism (学习与批判) published inn Tibetan in 1975. Study and Criticism was a flagship journal of the Criticize Lin, Criticize Confucius campaign, and Qinghai People’s Publishing House produced this Tibetan translation to cater to China’s Tibetan population. I have so many favorites! One book I really like is a small paperback compilation of important newspaper articles related to the campaign. I like this copy because it still has an original paper insert detailing all the typographical errors in the text. It looks like the printers printed it a little too hastily and only discovered the 40 (!) errors in the volume after they had finished the print-run. I have acquired books for free! In my department we have a book exchange shelf and I once found an English-language version of an important book from the campaign just sitting there. My thanks go to whichever UCSD professor decided they no longer needed that. Some of the books published in the campaign were replicated in 36-point type, silk-bound editions for Chairman Mao to read in his ailing years. I would love to get my hands on some of them, but I am yet to come across any copies. They are not the kind of thing that is readily available. Blackwell’s in Oxford. I have not bought any Chinese propaganda from there, but I used to work in the shop’s literature and languages department before I started my undergraduate degree at Oxford. Blackwell’s is a fantastic bookstore to browse around on your lunchbreak and you meet some fantastic customers. I worked with some amazing people during my six months there and learnt a lot from talking with Derek Walker and others in the Rare Books department. I have collected Chinese propaganda for years, but my real interest is in books/periodicals published in the 1970s during the Criticize Lin, Criticize Confucius campaign. In this campaign, the Chinese Communist Party orchestrated mass criticism of Confucius and Confucianism, as well calling on people to denounce Mao's former heir-apparent (Lin Biao) as a present-day lackey of Confucius. This campaign was the last hurrah of the Great Proletarian Cultural Revolution and publishers/printers produced some amazing print culture to substantiate the state's narratives and show people why Confucianism and Lin Biao were enemies of the people. I study the print culture of this campaign for my PhD, and over the last six years I have amassed a collection of books and ephemera. I just tried to count the collection and it falls somewhere between 600 and 700 items. My items range from books with a print-run in the hundreds of millions all the way down to pamphlets printed by the propaganda divisions of counties and villages. My collection also includes comic books, drawings, small posters, and periodicals. While most of the items are in Mandarin Chinese, I also own some books printed in English, Braille, and the languages of China's ethnic minorities. I can't remember which book I bought first because that was a long time ago! When building the collection I acquired a lot of pamphlets first, before moving on to more specialized books such as the comic books or the Braille items. My last purchase on my most recent research trip to China was a selection of articles from the theoretical journal Study and Criticism (学习与批判) published inn Tibetan in 1975. Study and Criticism was a flagship journal of the Criticize Lin, Criticize Confucius campaign, and Qinghai People's Publishing House produced this Tibetan translation to cater to China's Tibetan population. Blackwell's in Oxford. I have not bought any Chinese propaganda from there, but I used to work in the shop's literature and languages department before I started my undergraduate degree at Oxford. Blackwell's is a fantastic bookstore to browse around on your lunchbreak and you meet some fantastic customers. I worked with some amazing people during my six months there and learnt a lot from talking with Derek Walker and others in the Rare Books department.